Menheniot Bed and Breakfasts. Compare latest rates and Live availability for all your favourite places and places you have always wanted to go using our new My Shortlist feature. Click + to add to your Shortlist. Bed and Breakfasts in Menheniot, Cornwall for 1 night from Wed Apr 24, 2019 to Thu Apr 25, 2019 within 10 miles, in an Average Nightly price range of £1 to £200. Situated in the quaint Cornish village of Menheniot, this former circa 17th century coaching inn offers en-suite accommodation. Within easy reach of numerous local attractions, The White Hart offers 9 rooms, where you can relax within a traditional atmosphere. A full cooked breakfast is available every morning, with a lighter option also on offer. The restaurant is open from Monday to Saturday, serving a range of homemade specialities from the Ã¡ la carte menu. Relax with a real ale in the lounge and public bar areas, amid traditional slate floors and beamed ceilings. A beer garden is also available for when the weather is fine. A large public car park adjoins the property. Free WiFi is available and the property has Sky Sports. The White Hart Hotel is a 17th Century inn situated in the quaint Cornish village of Menheniot. We have seven letting rooms all of which are en-suite with colour televisions and provide tea and coffee making facilities. Freeview television is now available in all bedrooms with a variety of popular channels. We have a lounge bar/restaurant and a separate public bar which have been recently refurbished to a high standard. We are well known for our hearty full English breakfast and serve food every evening from our a la carte menu which also includes many homemade specials. The property itself has many original features including slate flooring timber beams and clone ovens. For people away on business we now offer Wi-Fi in all bedrooms and public areas free of charge. This has been found very useful and popular by all guests but particularly those on business trips. Just 300 metres off the A38, opposite Menheniot railway station, Sportsmans Arms Hotel is a traditional inn offering bright rooms with modern bathrooms. Liskeard is only 3 miles away, and Looe is a 15-minute drive. All bedrooms at the Sportsmans Arms are en suite, and have a flat-screen TV, tea and coffee facilities, and a hairdryer. Some rooms also have scenic views across the valley. The inn features a large car park, a beer garden with magnificent views. The traditional bar serves an excellent range of ales and beverages. A cooked breakfast is served daily for an additional cost, vegetarian and continental options are also available. Evening meals are not served, but guests can enjoy a range of excellent restaurants close by. Evening meals are not served, but guests can enjoy a range of excellent restaurants close by. Located in Menheniot, the Tregondale Manor Farm offers a a tennis court, free WiFi access, and on-site parking. The 5-star Gold Award bespoke country farmhouse is ideal for enjoying scenic walks and exploring Cornwall. With views of the rolling countryside and manicured lawns, each contemporary room offers tea and coffee making facilities and a flat-screen TV. The en-suite bath or shower rooms have complimentary toiletries and a hairdryer. In the mornings, Tregondale Manor Farm serves full cooked breakfast. Dishes are prepared using fine, local produce. Guests at Tregondale Manor Farm can relax in front of the fire in the shared lounge. The traditional working farm is also ideal for visiting nearby Bodmin Moor, Liskeard, Looe, and Polperro in South East Cornwall, along with National Trust properties, the popular Eden Project, St Mellion Golf International, and Adrenalin Quarry. The Eliot House Hotel Liskeard is set in the historic market town of Liskeard in South East Cornwall. The well presented Eliot House Hotel is a small luxury hotel consisting of 10 en-suite bedrooms that have been refurbished to a high standard. The public rooms consist of a licensed Bar Lounge Function Room and Restaurant serving Full English Breakfast Lunches 3 course Evening Meals and Sunday Carvery or just coffee if perferred. The Hotel also has the benefit of it's own large car park. The Eliot House Hotel Liskeard is set in the historic market town of Liskeard in South East Cornwall. br / br / br / br / The 19th Century building was the former town house of the Eliot family of Port Eliot Estate St Germans and was reopened in March 2011 after an extensive refurbishment programme. br / br / br / br / Situated just off the A38 and only 6 miles from the coastal town of Looe. The main rail line also offers easy access. Eliot House Hotel Liskeard is a versatile location providing the perfect location for private functions weddings or conferences. 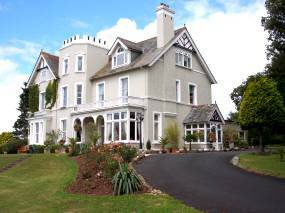 Eliot House Hotel is a central point for visitor attractions such as The Eden Project Lost Gardens of Heligan Looe Polperro Bodmin Moor Charlestown Harbour Plymouth Pavillions and Theatre Royal. br / br / br / br / The unique set up means that we can host functions to accommodate from 10 to 180 people. br / br / br / br / Internet access is available via Wi-Fi in the public rooms br / br / br / br / Function Room br / br / With its stunning wooden floor and own fully stocked bar this room can cater for a range of functions. br / br / br / br / Public Bar br / br / The well stocked bar offers a variety of well known beers wines and spirits. It is open to non diners as well. br / br / br / br / Lounge br / br / Is perfect for morning coffee afternoon tea or a light lunch. It can also be used for functions up to 20 people. br / br / br / br / Restaurant br / br / Offers a lunch menu as well as a Dinner menu with seasonal specials. It can also be used to cater for functions for up to 40 people. br / br / br / br / Bedrooms br / br / Newly refurbished en-suite bedrooms which all include freeview televisions tea & coffee facilities are now available and offer a comfortable stay. br / br / br / br / Light lunches or Dinner can also be enjoyed in our restaurant. br / br / br / br / Opening Times are Monday Saturday 10.00am 11.00pm Sun 12.00 2.30pm. br / br / br / br / There is also onsite parking. Located in Liskeard, Nebula Guest House offers a shared lounge. Free WiFi is at guests' disposal. The rooms in the guest house are fitted with a kettle. The rooms are equipped with a private bathroom with a bath or shower. The units have a wardrobe. The daily breakfast offers Full English/Irish and vegetarian options. Plymouth is 33 km from Nebula Guest House. The nearest airport is Newquay Cornwall Airport, 48 km from the property. Pencubitt House is a traditional adults-only country house featuring a guest lounge and a licensed bar, which overlooks the countryside of the Looe Valley. Free parking and free WiFi are provided, and Liskeard railway station is a 7-minute walk away. Each room at Pencubitt House features an en suite bathroom and tea/coffee making facilities. Some rooms boast scenic views of the gardens, of the surrounding countryside, and of the valley. A full English breakfast is served daily and it is made of locally-sourced ingredients. Liskeard town centre is 15 minutes' walk away where guests can find shops and restaurants. The world-famous Eden Project is 17 miles away and the small coastal town of Looe is 15 minutes' drive from the property. Lanhydrock Golf Club is 13 miles from Pencubitt House and Fowey is 20 miles away. The Lost Gardens of Heligan are 26.5 miles away and Bodmin Moor Wildlife Park is 12 miles away. Set in the picturesque village of Hessenford the Copley Arms offers 5 warm and cosy en-suite suite rooms all furnished to a high standard.This traditional inn has both a bar and a restaurant. The quality of their food is very well known and is made using local sources.From Springtime you can dine in the stunning seating area outside that overlooks the stream that runs through the village There s nothing more relaxing than having a drink in one hand and watching the stream to see what you can find! The Copley Arms is centrally located for a holiday to suit everyone. Within 4 miles there are many riding stables swimming pools watersports and there are plenty of coastal paths to find those hidden villages.Remember to visit the infamous Monkey Sanctuary! Not forgetting that every great inn has it s ghost and here Matthew minds the bar after hours! Set in the picturesque village of Hessenford, the Copley Arms offers cosy en suite rooms, a bar and a restaurant. The Copley Arms is situated 8 km from Looe, with the historic fishing village of Polperro close by. The traditional inn serves lunch and dinner, and uses local ingredients where possible. An outdoor seating area overlooks the stream. All 5 rooms have recently been refurbished to a high standard. Our B and B in Looe: Dovers House Bed and Breakfast Looe Welcomes its Visitors; Providing Quality and Central Accommodation in Cornwall at an Affordable Price. Dovers House is a family run B&B in Looe just a few minutes drive from the historic fishing port of Looe Harbour; with it's busy shops sandy beach and variety of restaurants bistros and cafes. We provide a tranquil base for those looking to explore Cornwall's beautiful countryside coastline and breathtaking attractions. Rod and Line is located in Tideford. Free WiFi is featured. The apartment offers a flat-screen TV and a private bathroom with free toiletries, a hair dryer and shower. A Ã la carte, Full English/Irish or vegetarian breakfast is available every morning at the property. Guests can relax in the garden at the property. Plymouth is 14 km from Rod and Line, while Padstow is 45 km away. Newquay Cornwall Airport is 48 km from the property. Five miles west of Saltash, Kilna Guest House offers bed and breakfast with countryside views in the village of Tideford. On the A38 road to Liskeard and Bodmin, this Cornish guest house provides free parking, WiFi and a summer house. Each room has a flat-screen TV, alarm clock and tea and coffee facilities. Rooms have an en suite or private bathroom with bath or shower. There is also a guests' lounge. Kilna Guest House is around 11 miles from Plymouth and 8 miles from Liskeard. You can drive to the coastal towns of Looe and Polperro in 20-25 minutes, and the Eden Project in around 40 minutes. Trecarne House is located in the countryside surrounding Liskeard and just 1 mile from the beautiful Cornwall Area of Outstanding Natural Beauty. This property has views of the countryside and the nearby moorland. All rooms have countryside views, a flat-screen TV, an iPod docking station and a bathroom with free toiletries. Some rooms have Juliette balconies. In the garden there are BBQ facilities, a terrace, outdoor table tennis, trampoline and a secure padlock where children can play safely. In the house, guests can relax in the shared lounge. Guests will also find a library, board games, indoor table football, darts and a small snooker table (on request). An extensive breakfast menu is available to purchase, including continental, buffet, AGA cooked selection, or buffet. Breakfast is flexible and can be served from early morning until 11:00, except on departure day when it is until 10:00. A continental can be served in the room. Nearby attractions include the famous Eden Project, 40 minutes' drive away. Golitha Falls and the River Fowey are within 2 miles of the property. The Hurlers and Cheesewring monuments are within 10 minutes' drive of the Trecarne. We would like to invite you to spend some time here at Penvith Barns in sunny Cornwall. Whilst we cannot guarantee wonderful weather we can guarantee you will have a wonderful time. Many of our guests are return visitors and for those of you who were fans of our predecessor Alison we can promise you the same level of attention to detail and warmth of welcome that you have come to expect from Penvith Barns. Trecarne House is so much more than just accommodation. br / br / br / br / Recently singled out by AA researchers as one of the top 9 family friendly destinations in the UK and the only property chosen in Cornwall. br / br / br / br / Sitting at the end of a quiet country lane and with spectacular views it s so peaceful. The perfect family get away & no noisy traffic to pollute the air. br / br / br / br / Trecarne House is AA 4 star Silver Award luxury accommodation. The house is light spacious and airy with a Scandinavian feel with all our suites having stripped pine wood flooring and spectacular uninterrupted countryside views.All our rooms are equipped with everything to make your stay comfortable and relaxed including free Wifi flat screened TV stereo system with ipod docking station & CD player full range of complimentary drinks tray complimentary natural toiletries bath gels and moisturisers. br / br / br / br / Outside we have ample Free parking. In the garden there is a large trampoline outdoor table tennis and an Italian style courtyard with a BBQ. Indoors we have table football small snooker table lego toys books and DVDs so something for everyone. br / br / br / br / We re very proud of our award winning breakfast which is cooked fresh daily in the Aga. We are passionate about giving our guests the best local organic produce wherever possible and we cater for all dietary needs. Including man s best friend yes we have the Top Dog award too. Just let us know and we can produce a delicious dish for your favourite pet. br / br / We can prepare packed lunches and also cook evening 2 & 3 course suppers prepared and cooked fresh daily from ingredients in the pantry. We just ask that you give us at least 24 hours notice if you would like dine with us. br / br / br / br / Located on the Southern edge of Bodmin Moor the Hidden Heart of Cornwall Trecarne House is the ideal base from which to explore all that Cornwall has to offer. Come and make somememories of your own. This is a place where within seconds of arrival you know you've made a wise choice where green lawns rolling meadows and a shimmering lake vie for your attention. Inside a home rich with much loved pieces antiques thick wool carpets soft colours fresh flowers and a light airy drawing room where in winter you can cosy up to the open log fire and in summer the sun pours though the windows. All bedrooms have the best crisp linen floaty goose down duvets and warm fluffy towels. Located in Pillaton, The Weary Friar Inn provides a terrace. The property has a bar, as well as a restaurant serving British cuisine. Free WiFi and luggage storage space are provided. All units in the inn are fitted with a kettle. The private bathroom is equipped with a bath. The units feature a wardrobe. Plymouth is 22 km from The Weary Friar Inn, while Tavistock is 24 km away. The nearest airport is Newquay Cornwall Airport, 66 km from the property. A traditional Cornish inn built in 1709, Eliot Arms provides en suite rooms with countryside views, around 5 minutes' walk from St Germans Train Station. Serving real ales, home-cooked meals and full English breakfast, it offers free parking and Wi-Fi. Breakfast is freshly cooked to order each morning. The Eliot Arms menu also features cereals, fruit, toast, juices, tea and coffee. Each room has a flat-screen TV, hairdryer and tea and coffee facilities. All have shower facilities with complementary toiletries. This inn is around 8 miles from Saltash, Near the Devon/Cornwall border, it is around 14 miles from the centre of Plymouth and 16 miles from Dartmoor National Park. Built in 1860, Meneglaze is a former sea captain's house situated 5 minutes' walk from Looe town centre. Free on-site parking is provided to all guests. Free WiFi is featured in each Meneglaze room, as well an en suite bathroom, Egyptian cotton bedding and a flat-screen TV. A small fridge and tea/coffee making facilities are also included. Each room is fitted with a USB charging port. A hearty Cornish breakfast is served each morning, as well as homemade marmalades and jams, and award-winning Hog's Pudding. Many places to eat can also be found within the town centre. Looe railway station and the banks of the East Looe river are just a minute's walk away, with the nearest sandy beach just over 10 minutes away by foot. A detached B&B Ground floor Apartment on the Moor at Minions, Great Views, Fantastic Food, perfect for Walking, Cycling, Climbing, or just Relaxing in beautiful Cornish surroundings. En Suite With Sitting room, Parking just out side. Offering a sun terrace overlooking the East Looe River, The Rivercroft Hotel offers accommodation in Looe, Cornwall. Guests can enjoy the on-site bar and restaurant. Rooms feature tea/coffee making facilities. Some rooms offer a view of the river. Free WiFi is featured throughout, and there is luggage storage space at the property. You can play darts at the hotel. The property is on the South West Coast Path. Looe railway station is 200 metres away. Polperro is 7.2 km from the Rivercroft Hotel, while Plymouth is 32.2 km away. The nearest airport is Newquay Cornwall Airport, 53 km from Rivercroft Hotel. Smeaton Farm is a 450 acre working farm situated within the Duchy of Cornwall. It is run by husband and wife team Richard and Sarah Jones. Set in St Mellion, Smeaton Farm Luxury B&B offers accommodation with free WiFi. A flat-screen TV and DVD player are available in some units. A continental, Full English/Irish or vegetarian breakfast is available every morning at the property. Guests can go cycling or relax in the garden. Plymouth is 19 km from the bed and breakfast, while Tavistock is 25 km from the property. The nearest airport is Newquay Cornwall Airport, 69 km from the property. St Mellion International Resort offers four-star accommodation in Cornwall. The property is located within 450 acres of countryside and offers guests use of its leisure facilities and fine dining at its 2 AA-Rosette restaurant, An Boesti. Rooms at the hotel feature a contemporary design and Elemis toiletries. Additional amenities include a work space and chair, over-sized picture windows, heated mirrors, tea/coffee making facilities, a flat-screen TV, internet access and a laptop-sized safe. The property's Jack Nicklaus Signature and Kernow golf courses have been included in the European Tour with the PGA, and guests can play these courses during golf weekends or corporate entertainment days. Guests are invited to use the property's leisure pool and 25-metre lane pool to keep fit or relax. A fitness centre complete with spinning bikes, rowing machines, cross-trainers and treadmills is also available. For guests that wish to relax, the hotel's Elemis Spa offers a sauna, steam room, spa pool and treatment rooms. St Mellion International Resort is 12 miles from Plymouth city centre and its train station. Dartmoor National Park is 13 miles away, while the Eden Project is 29 miles away and The Lost Gardens of Heligan is 37 miles from the property. Set in the beautiful and peaceful countryside of Cornwall with pleasant views over the lush Lynher Valley. The Crooked Inn is a mere six miles from the historic heart of maritime Plymouth. With the added attraction of traditional Cornish hospitality this family-run inn has tastefully designed en suite accommodation making it an ideal base for a west country holiday weekend or overnight break. Though only half a mile from the Penzance to Plymouth trunk road this friendly hostelry is within easy reach of local resorts secluded beaches moorland and other attractions for which Cornwall England s most westerly county is famous. br / br / br / br / Your Hosts will not only ensure a pleasant welcome but will also make you feel at home in this delightful pub with an ambience all of its own. An extensive range of home cooked meals using local produce is served in the ancient timber beamed bar before an open log fire. Tony keeps a well-stocked cellar with a good choice of real ales wines & spirits. br / br / br / br / The Rooms are available all through the year for the short stay business man needing quick connections to Plymouth and the South West. For those who prefer to take advantage of the mild climate of Cornwall in the quieter seasons of the year. Our bar & restaurant are located in the oldest part of the property. Still with many original features it is that perfect mix between traditional surroundings & modern comforts. The open fire keeps you warm in the winter whilst the doors open out on marvellous views for the lazy summertime afternoons. br / br / br / br / Our extensive lawns and gardens spread around the entire property we have more than enough space for a marquee so if your wedding or birthday requires more room then we can accommodate you easily. We have a great BBQ area for sunny days & warm evenings. We can arrange a complete BBQ feast for as many or as few as you require.